Use The Contact Form Or Email The Chamber To Submit Your Upcoming Events For Your Business Or Organization. Thank You. 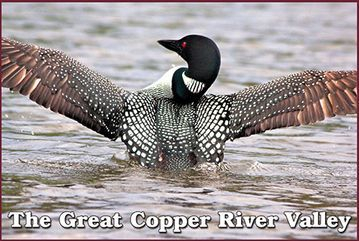 The Chamber would like to thank the photographers, organizations and groups that have generously donated their pictures for use on this site about the Copper River Valley. Special thanks to: Glennallen BLM office, National Park Service, Neil Hannan, Jeremy Matlock, Marnie Graham and Bearfoot Alaska Travel Magazines. If you see one of your photos here that you donated to the Chamber, email us and we'll put in your name as credit. Thank you so much for everyone's help. If you have photos you'd like to share with the traveling public, please contact the Chamber, using the email form below.